 (Obtained from Haematologica Journal website: haematologica.org). Since sFLC assays are intrinsically more sensitive than sIFE for detection of monoclonal FLC production (Chapter 4), earlier detection of tumour relapse should be possible in IIMM patients who relapse with FLCs alone or potentially, a proportion of those who relapse with intact immunoglobulins and FLCs. In a study of 187 MM patients, Willenbacher et al. found that relapse was detected a median of 3 months earlier by sFLC levels than by conventional monoclonal protein measurements. Similar findings were reported by Dejoie et al. , who reported that of the 228 IIMM patients who progressed by SPE, 6.25% showed an increase in sFLCs that preceded the increase in intact immunoglobulin, by a median of 63 days. In a smaller study by Mösbauer et al. 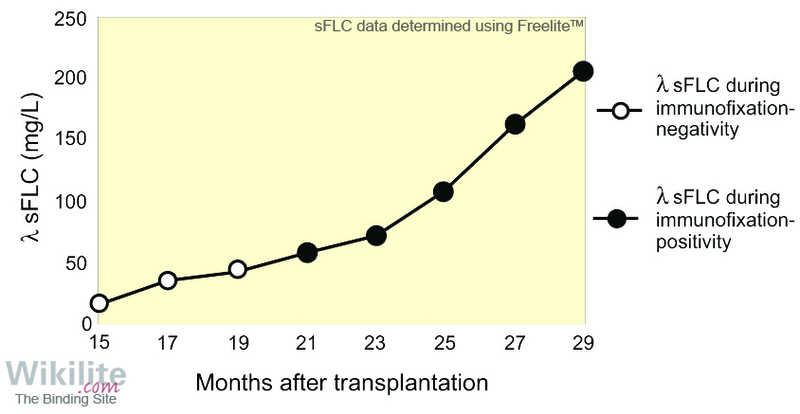 , relapse was identified earlier in eight of nine IIMM patients when sFLC ratios were used rather than IFE (median, 98 days; range 35 - 238 days) (Figure 18.9). In situations where relapse occurs relatively rapidly after successful treatment (i.e. 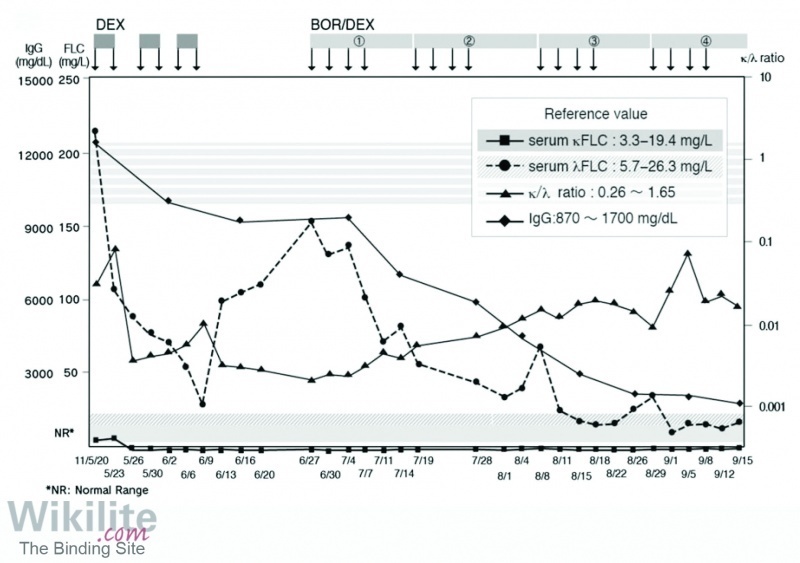 within a few months), due to their relatively long half-life, monoclonal IgG levels may not normalise before relapse. Therefore, falling concentrations of IgG hide the early increases caused by tumour relapse. In contrast, because of their short half-life, an increase in sFLCs at relapse occurs from lower baseline levels and can be more readily detected. This is illustrated in a case study by Fuchida et al. (Figure 18.10).